Icebergs, like penguins and polar bears, are an iconic symbol of the polar regions. You may have seen spectacular images of towering, sculpted white ice or even pictures of blue or striped icebergs. How are they formed? What causes differences in color? How do these massive chunks of ice float? Read on to learn about all things iceberg! Icebergs are found in the Arctic, North Atlantic, and Southern Oceans. Icebergs float in salt water because they are formed by calving, or splitting, glaciers and are thus made of fresh water. The size of icebergs varies widely. Small bergs (a little smaller than a car) are known as “growlers,” while slightly larger bergs (about the size of a house) are called”bergy bits.” Larger bergs are classified as small, medium, large, and very large. And very large they can be. The tallest known iceberg in the North Atlantic was 550 feet (168 m) above sea level. Since the bulk of an iceberg is below the water, the entire berg was estimated to be as tall as a 55-story building! 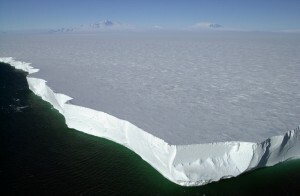 Iceberg B-15, which calved from the Ross Ice Shelf of Antarctica in 2000, was half a mile thick and covered an area of about 4,500 square miles (about the size of Connecticut). B-15 subsequently broke into smaller pieces, named B-15A, B-15B, and so on. Why did this massive berg break apart? Seismic recordings showed that an Arctic storm six days prior to the event was to blame. The storm created ocean swells that traveled over 8,000 miles and caused B-15 to crash repeatedly against the coast. The northern edge of the giant iceberg B-15A, located close to Ross Island, Antarctica. Photo courtesy of Josh Landis, National Science Foundation. Icebergs are also classified by their shape. 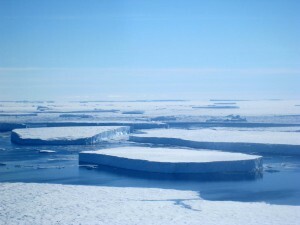 Tabular icebergs have steep sides and a flat top like a plateau, while non-tabular icebergs include irregular shapes such as rounded tops, spires, sloping sides, and blocks. Wind and water erode icebergs into amazing sculptural shapes. Icebergs come in a variety of shapes. From top to bottom, photos courtesy of Galen Dossin, Zee Evans, and Jon Brack, National Science Foundation. 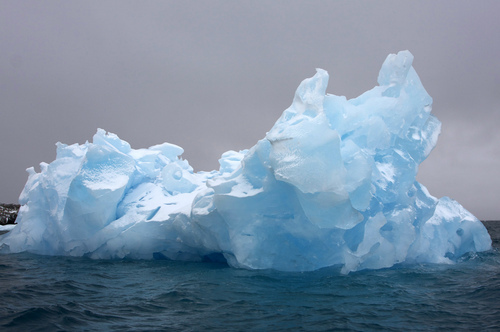 Most icebergs are white in color, but some may appear blue or even green. Ice is full of tiny air bubbles that scatter all color wavelengths the same amount, giving the ice a white appearance. If the ice is compressed, the bubbles are squeezed out and the blue light is scattered much more than other colors – making the ice appear blue. Algae often grow on the underside of sea ice and icebergs, producing green stripes that are only revealed when the ice rolls over and exposes the previously underwater sections. You have probably heard the statistic that approximately 90 percent of an iceberg is found under water. That’s an amazing statistic to consider given the massive size of some icebergs, but the very fact that ice floats is pretty remarkable. To understand why ice floats, it is necessary to understand the concept of density. Density is calculated by dividing an object’s mass (amount of matter) by its volume (the space it occupies), or D=M/V. Density essentially describes how tightly packed a substance’s atoms are. Substances with a high density have tightly packed atoms, while the atoms in a low-density substance are more spread out. Density is a defining property of a substance, and it is constant no matter how much of the substance there is. For example, pure gold always has a density of 19.3 g/mL (grams per milliliter). Pure liquid water’s density is 1.0 g/mL, and a standard by which to compare other substances. When water freezes, the water molecules spread out to align in a definite crystalline structure. You’ve observed this if you’ve ever noticed the bump on an ice cube or had a can of soda explode in the freezer. While most other substances contract, water expands as it becomes a solid. Because water expands as it freezes, ice takes up more space (has a greater volume) than the liquid water does. But the amount of matter hasn’t changed – it is just spread out over a larger space. This means that the density of ice (0.92 g/mL) is less than that of liquid water (1.0 g/mL). And because ice’s density is lower than that of water, ice floats in water. What about the density of salt water? Because of the dissolved sediments and minerals, sea water is slightly denser than pure water. Its density is approximately 1.03 g/mL. That means that ice (like icebergs) also floats in sea water. In fact, fresh water from melting icebergs will form a layer on top of the denser sea water. Density also explains why most of an iceberg is found beneath the ocean’s surface. Because the densities of ice and sea water are so close in value, the ice floats “low” in the water. Remember that the density of ice is 0.92 g/mL, and the density of water is 1.0 g/mL (1.03 for salt water). This means that ice has nine-tenths, or 90 percent of water’s density – and so 90 percent of the iceberg is below the water’s surface. In contrast, a piece of wood with a density of 0.5 g/mL (half that of water) would float with half of its volume below the surface of the water. A cork with a density of 0.2 g/mL (20 percent that of water) would float with 20 percent of its volume below the surface, and so on. Of course, there are some small variations that affect the exact percentage of the iceberg below water. 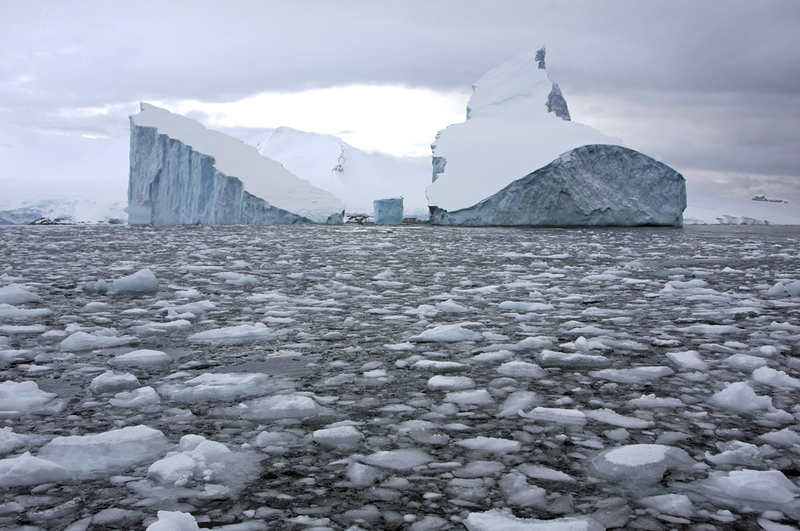 Icebergs may contain sediments, dust, and other particles picked up by the glacier before calving. They also may have algae growth in and on their submerged surface. These icebergs are not a pure substance, and thus their density is no longer 0.92 g/mL. 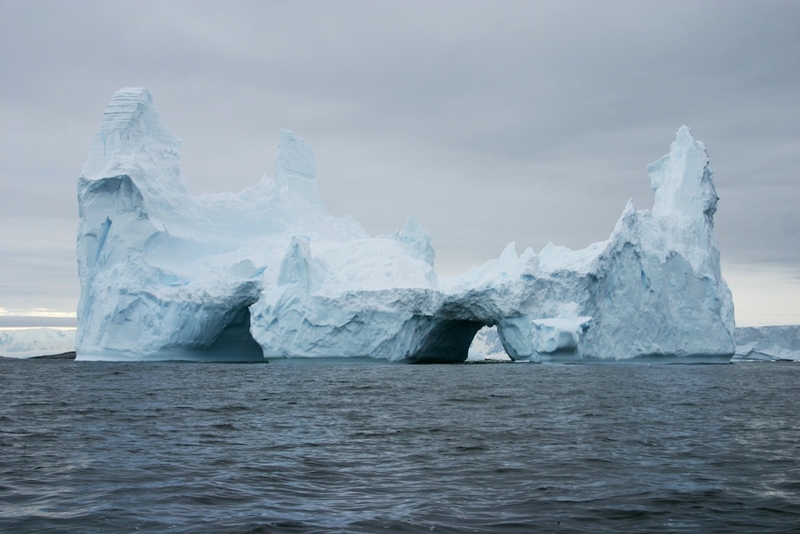 The temperature and salinity of the water in which an iceberg is located may also vary, meaning that the sea water’s density may not be exactly 1.03 g/L. While these variations are common, they do not change the densities much – and so 90 percent is a good estimate for the submerged part of an iceberg! Although they aren’t living, icebergs do have a life cycle. They begin as part of a glacier, building for tens of thousands of years and slowly moving toward the ocean. Once an iceberg calves, it typically lasts for three to six years – shorter if it floats into warmer water. Waves wear away at the iceberg and crash it into other icebergs or land. Thawing and melting create crevasses (cracks) that may lead to further calving. Some icebergs simply melt away, while others collapse more violently. Some icebergs never move into warmer waters and may last 50 years or more. Icebergs may appear sterile and lifeless, but that’s not the case. Ice algae may grow in-between ice crystals or on the underside of a berg, playing an important role in primary production and in the marine ecosystems. Small fish avoid predators by hiding in ice holes, while invertebrates come to feed on nearby krill. 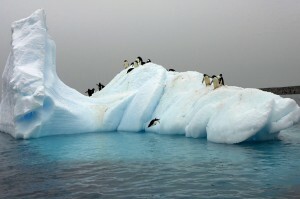 Seabirds may nest on icebergs as well. Extremely large icebergs, such as B-15 and the more recent C-19, can negatively impact marine ecosystems. 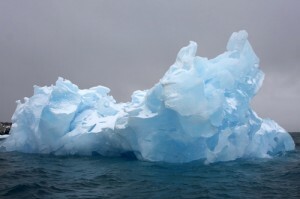 Large bergs can reduce the amount of sunlight hitting the water, thus decreasing the production of the phytoplankton that forms the base of the marine food web. They also block the paths that penguins use to reach open water to find food. Adelie penguins dive off an iceberg near Paulet Island, Antarctica. Photo courtesy of Nick Russill via Flickr. Licensed under a Creative Commons 2.0 license. Icebergs near the coast of Antarctica scour, scrape, and gouge the seafloor. Increased calving as a result of shrinking winter sea ice will create more disturbances on the seabed, where the majority (80 percent) of all Antarctic life occurs. While some disturbances create space for a high diversity of organisms, scientists believe that an increase in iceberg action may actually decrease biodiversity. The well-known story of the RMS Titanic, which illustrates the hazards of icebergs, led to the formation of the International Ice Patrol. The Ice Patrol (administered by the U.S. Coast Guard) keeps a close watch over the area off the coast of Newfoundland, known as Iceberg Alley because of the high number of icebergs found in the waters. The Ice Patrol collects data from a variety of sources: aircraft flights, radar, and ice sightings from ships. It uses computer modeling and current information to predict the path of icebergs and warn ships via radio and the Internet. While these precautions have reduced the number of incidents with icebergs, the risk still remains. The Antarctic Circumpolar Current tends to trap icebergs within the Southern Ocean, although some occasionally escape and enter shipping lanes in the southern Atlantic, Indian, and Pacific Oceans. Icebergs and sea ice do present a problem for research vessels and cruise ships within the Southern Ocean, however. This site provides basic information and interesting facts about icebergs, shapes, sizes, and colors, the journey of an Arctic iceberg, dangers, and possible uses. The site may be appropriate for upper elementary students as well as teachers. A six-part article providing an overview of iceberg basics, life cycle, statistics, ecology, and danger. 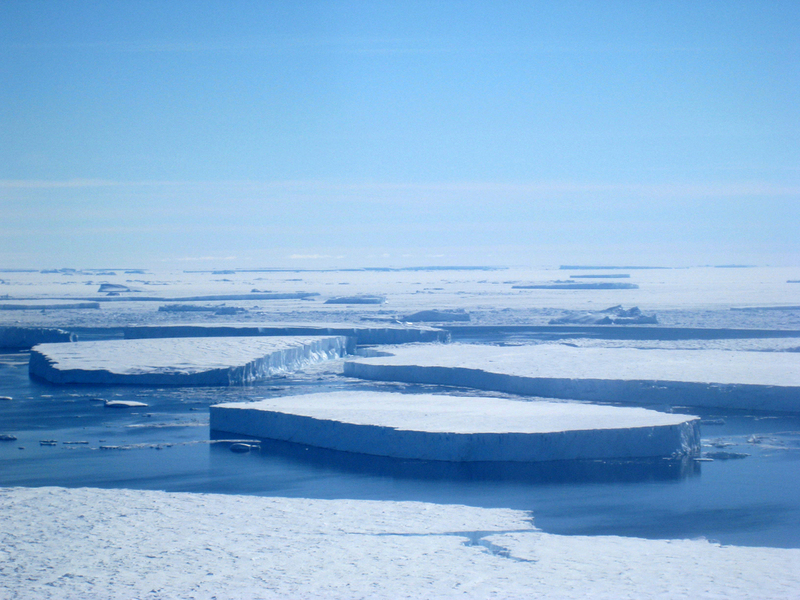 This page from the National Snow and Ice Data Center provides basic information on icebergs as well as links to the International Ice Patrol, U.S. National Ice Center, and other useful resources. This page explains the concept of density, provides an explanation of why ice is less dense than water, and why ice floats. This blog post discusses the ecosystem found around and on the underside of icebergs. The entire National Science Education Standards document can be read online or downloaded for free from the National Academies Press web site. The following excerpt was taken from Chapter 6. Materials can exist in different states – solid, liquid, and gas. Some common materials, such as water, can be changed from one state to another by heating or cooling. A substance has characteristic properties, such as density, a boiling point, and solubility, all of which are independent of the amount of the sample. A mixture of substances often can be separated into the original substances using one or more of the characteristic properties. This article was written by Jessica Fries-Gaither and Alison Schirmer Lockman. For more information, see the Contributors page. Email Jessica at beyondpenguins@msteacher.org. Copyright August 2009 – The Ohio State University. This material is based upon work supported by the National Science Foundation under Grant No. 0733024. Any opinions, findings, and conclusions or recommendations expressed in this material are those of the author(s) and do not necessarily reflect the views of the National Science Foundation. This work is licensed under an Attribution-ShareAlike 3.0 Unported Creative Commons license. Thank you for helping me on my report!